For a mid-level SQL developer profile, this is one of my favourite interview questions if their current projects involve some sort of paging mechanism while displaying results on a grid. What is the minimum number of parameters that your stored procedure needs to implement server-side paging? Despite the multiple blog posts around this topic, this question surprisingly still stumps most of the developers. Of course, the implementation may vary – one can have multiple additional parameters like the sort column and the sort order, but at the very minimum one needs the two (2) parameters listed above. 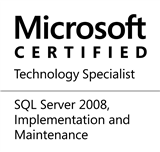 This entry was posted in #SQLServer, Community and tagged #SQLServer, #TSQL, DBA, Development, Guidance on February 8, 2016 by nakulvachhrajani.